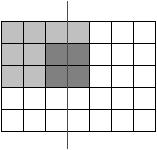 A rectangle is divided in n·m squares of equal size, like a matrix with n rows and m columns. By straight cuts from border to border, along the sides of the squares, the rectangle shall be completely cut up, leaving n·m separate squares. The following picture shows for n = 4 and m = 6 the start and the end of the procedure and in the middle a possible situation after several cuts. B : Before each cut pieces may be stacked or laid alongside each other, allowing cuts through more than one piece. This cut (red) is legal in variant B , not in variant A . If you happen to have the right idea for variant A you will easily find the solution, without any computation. But you can also find the solution by testing the possible ways to cut up small rectangles; the rule for determining the minimum number of cuts will become evident. Concerning variant B only this shall here be said: The intuitive idea for fastest cutting is the best one.